Ezek. 1:10 As for the likeness of their faces, they four had the face of a man... (Superego), and the face of a lion... (Intuition): and they four had the face of an ox... (Self); they four also had the face of an eagle... (Libido). Gen. 3:11 And he, (the Collective Unconscious Mind), said, "Who told thee that thou wast" (independent and) "naked" (from the council of the unconscious psyche: [Psalm 82])? "Hast thou eaten of" (the Self), "the tree" (of Common Sense? Have you feasted upon the fruit of the Psyche), "whereof I commanded thee that thou shouldest not eat?" 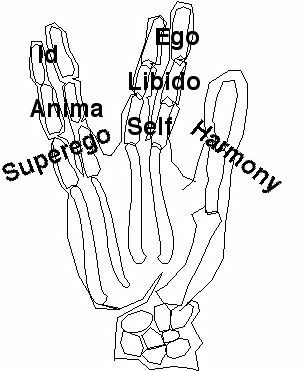 Gen. 3:12 And the man, (the now satanic Libido), said, The woman (within, the devilish Anima), whom thou gavest to be with me, she, (my Intuition), gave me of the tree (of selfish Self-centeredess), and I did eat (the feast of Sensation, subconsciously, of its common sense of a personal good in Selfishness). Gen. 3:13 And the LORD, (their Collective Unconscious Mind, the saving messiah, the true survival mechanism), God, (phylogenetically imaged in man's Unconscious Mind), said unto the woman, (the seat of envy and desire), "What is this that thou hast done?" And the woman said, (the logic of thoughts emanating from) the (so logical and so scientific) serpent, (the Superego), beguiled me (with false predictions of my survival), and I did eat (as that False Prophet advised of the apparent Common Sense in a principle of Selfishness). Gen. 3:15 And I will put enmity, (a contradictory perception), between thee, (Logical/Mathematical Intelligence), and the (Spatial/Visual Intelligence of) woman, (Intuition) and between thy (genetic) seed, (controlling human traits) and her (genetic) seed (Intuition), it shall bruise (the rational sense) thy head, and thou, (in Science), shalt bruise (his liberty and restrain), his heel, (the Animus). Gen. 3:16 Unto the woman he said, (by nature of your powerful Intuition), I will greatly multiply thy sorrow and thy worry; in worry (of Maternal Instinct) thou shalt bring forth concerns; and thy (sexual) desire, shall be (acquiescent) to (those of) thy husband, and he shall rule over thee.